The Environmental Working Group has a list of products they call the Dirty Dozen. These are fruits and vegetables known to be highly treated and altered by pesticides and other chemicals – whereas the Clean 15 are general safer. Now, I’m not big in to these lists, I’m an old fashioned “that which does not kill me…” kind of guy. But when my neighbor showed me this quick and simple app, I thought some people out there might want to know it! 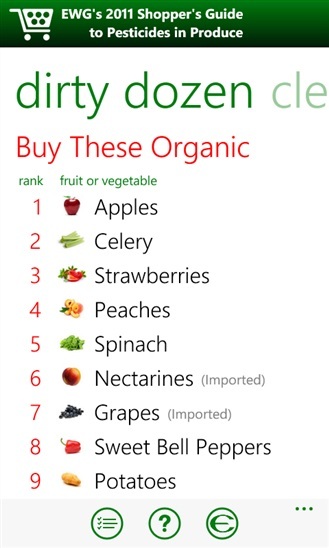 The app is self contained and has the Dirty Dozen and the Clean 15, as well as a list of several dozen common grocery items that you will find in your home, and how they rank among the others as far as toxins go and whether or not you should consider buying “organic.” The app, of course, is simply called Dirty Dozen on the Windows Phone. Enjoy!